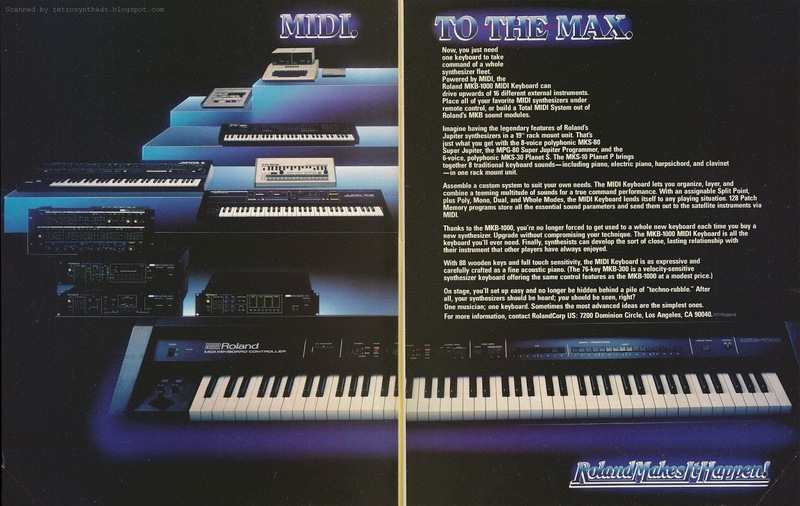 Roland "MIDI to the Max" two page colour advertisement featuring the MKB-1000 MIDI Keyboard, MKS-80 Super Jupiter synthesizer, MPG-80 Super Jupiter Programmer, MKS-30 Planet S synthesizer and MKS-10 Planet P from page 6 and 7 in the December 1984 issue of Keyboard Magazine. 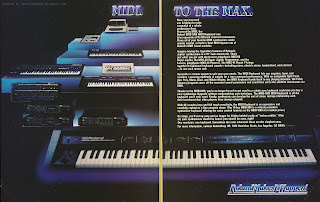 Five months before this ad began to run in Keyboard, Roland had officially announced their love of MIDI with an extended fold-out promo piece that appeared in the July 1984 issue of Keyboard. That piece unfortunately seemed to have made a one-time-only appearance. Well, in the meantime, true to their tag-line, the company had definitely been continuing to "make it happen" when it comes to MIDI, and wanted readers of Keyboard to know. This time with a proper two-pager that began appearing in the December 1984 issue, and continuing on in 1985 from January to March, as well as the July issues. Normally I try to scan the best version of the ad possible, but in this instance I decided to go with this version. Why? To make a point about the bad print job in that December 1984 issue. In all subsequent occurrences, this ad appeared as a centrefold that allows for one continuous 2-page print. So, for example, that long MKB-1000 keyboard that spans the two pages will look like... er... one continuous keyboard. But in that December issue, the ad appeared on pages 6 and 7, so those two pages end up being printed separately, and then only through the binding does it end up sitting next to each other. If the binding of the magazine doesn't line up (exactly what happened here), you end up with that big white line running down the middle. To make matters worse, that white line is emphasized due to that hip black background used in the design. I'm guessing Roland made the conscious decision to move the ad to the centrefold spot after that first run because of this issue. Just a theory, but it makes sense. So why is Roland all over MIDI? Well, with MIDI, the keyboard and front panel controls no longer need to sit in the same box as the guts of a synthesizer. Put them in separate boxes and let the consumer pick and choose. Already have a keyboard with MIDI like a Roland MKB-1000? Then just get the guts of your next synthesizer in a box. All with the added benefit of decreased cost to the consumer. And those little stackable 19 inch racks take up much less real estate in a studio. Although this ad focuses on the MKB-1000 for the most part, it's those 19 inch rack mounts that got my attention. Those were and still are a dream come true for a bedroom computer musician such as myself. All that synthesis power in little boxes, controlled by my Apple IIe and Master Tracks. It was a whole new world. MKB-1000 ($2,195.00) and MKB-300 ($1,295.00) MIDI keyboard controllers feature 128 programs, keyboard split points with separately assignable MIDI channel, and transposition. MKS-30 Planet S synth module ($1,195.00) features 6 voices, 64 patches, memory cartridge, 32 synth parameters. Can get the external PG200 programmer. MKS-10 Planet P rack electronic piano module ($1,195.00) features 16 voices, eight presets, stereo chorusing, flanging, and tremolo. MKS-80 Super Jupiter synth module ($2,495.00) features 8 voice, 16-VCO, velocity and aftertouch, memory cartridge, 96 programs. Hey - where's the MPG-80 programmer specs? Price? Booo. I'm feeling a little bajiggity without that info being included. It's just the way my brain is programmed. Its like that spec sheet isn't complete without it. Geeez. "Who would have guessed that something as simple as MIDI could cause so many ripples in the way electronic musical instruments are designed? What was originally intended as nothing more than a system for playing one instrument from another's keyboard has stood the synthesizer world on its ear. We're seeing multi-track sequencers designed to mimic the function of multi-track tape recorders, sequencer programs for personal computers, synthesizers (sans keyboard) in a rack, and a plethora of MIDI-equipped controllers, some keyboard-oriented, some not." The report also provides that missing piece of info on the MPG-80 programmer for the MKS-80. The price: $495.00. Aaaaah - finally. Bajiggity-ness is decreasing. Now I just have to go back in time and get that price included in the Spec Sheet.